Get a glimpse of the museum and around the district through the gallery. Take a look at who we are and how we came about. Learn more about the history of the courthouse, the museum, our town and its surrounds. Unlike many museums we don't have a set entry charge to the museum, instead all we ask is a gold coin donation. We are not supported financially by the council or the government and do ask that you please support us when you come by for a visit to help with the upkeep of the site. 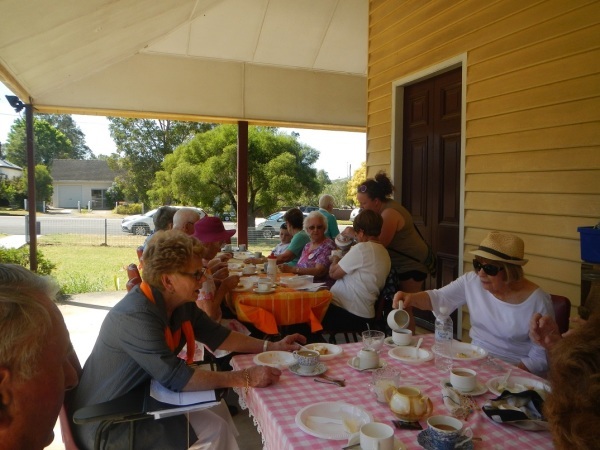 If you are a member of a group that takes day trips and would like to visit us we do host morning teas on our verandah. We serve tea and coffee with a variety of home made delights such as apple pie, scones with home made jam, cakes and slices. You may choose to include lunch to which we can include sandwiches or you may choose to move on to our local bowling club, pub or cafe which all have a great choice of dishes to choose from. Included with the price of our morning tea is a guided walking tour of the town and entry to the museum. Please contact us for more details and for pricing per person. The information contained in this website is for general information purposes only and is accurate to the best of our knowledge. We make no representations or warranties of any kind, express or implied, about the completeness, accuracy, reliability, suitability or availability with respect to the website or the information, or related graphics contained on the website for any purpose. Any reliance you place on such information is therefore strictly at your own risk. Through this website you are able to link to other websites which are not under the control of the Clarence Town Museum. We have no control over the nature, content and availability of those sites. The inclusion of any links does not necessarily imply a recommendation or endorse the views expressed within them. Every effort is made to keep the website up and running smoothly. However, Clarence Town Museum takes no responsibility for, and will not be liable for, the website being temporarily unavailable due to technical issues beyond our control.